TWO POSTS?.. I must be in the Christmas spirit! I just have some new stuff to show off! Its my time to get em out there! 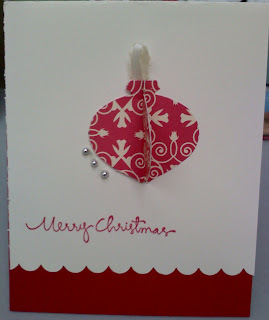 I found the making of this ornament on Splitcoaststampers and thought THIS WAS SO ME!! So after I mass produced cards for my soldier boy, I needed something for ME to send ... I think this might just be the answer! I deeply apologize for not remembering WHO I stole... I mean cased this from. If its you- let me know - I will give credit to you!! PROMISE!! Simple enough for me to make a few dozen with that "nasty" Merry Moments DSP, that I have in my stash. I used Vanilla CS with it. And Real Red to complete it. I like the silver pearls that I added as an after thought. The Ornament will 'fold down' for putting in an envelope and HOPEFULLY, the recipient will be able to pop back up - I tested on my boss, if she can do it without being told, its possible! LOL..